Award winning actor, comedian and host of NBC-TV’s top rated “America’s Got Talent,” Nick Cannon was named Honorary National Chair of the National Kidney Foundation's Kidney Walk program, kicking off this March. More than 100 events are held around the country, drawing 100,000 walkers on 5,000 teams with the goal of raising $8 million throughout the year. 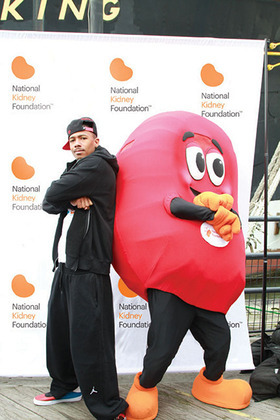 Nick Cannon Enjoys the Kidney Walk with Sidney the Kidney. The Kidney Walks raise awareness and funds to support the fight against kidney disease. Cannon plans to shine the spotlight on what he terms the body’s least known but most hardworking organ—the kidney. He never gave his own kidneys a second thought, and was hospitalized over a year ago for acute kidney injury and diagnosed with lupus nephritis. His condition has since stabilized and he’s stepping out in support of the National Kidney Foundation’s Kidney Walk. “The kidneys filter out toxins in the blood, acting as the body’s purifier, but unless they stop working, people pay no attention. The fact is there are 26 million Americans with kidney disease and most don’t know it. One in three people in this country are at risk because of high blood pressure and diabetes—the two leading causes. None of us can afford to ignore this anymore so I urge everyone to lace up and join a Kidney Walk team,” says Cannon. As National Honorary Chair of the National Kidney Foundation’s Kidney Walk, Cannon will promote the events through traditional and social media and appear in radio public service announcements, on the Kidney Walk website and in videos and print materials. He will mount his own fundraising campaign through www.TeamNickCannon.com.